After upgrading to a newer version of Mac OS X (Yosemite 10.10 and El Capitan 10.11) or macOS (Sierra 10.12 and High Sierra 10.13), you may end up getting an annoying new pop-up message whenever you start your computer. 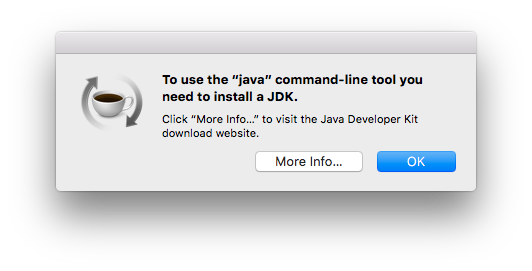 It says, “To use the java command-line tool, you need to install a JDK.” It asks you to click “More Info” and visit the JDK (Java Developer Kit) download website. The reason you’re receiving this message is due to the removal of Java support in newer versions of OS X for security reasons. Older software such as Adobe Photoshop and Illustrator requires legacy Java support. Without a compatible Java command-line tool for these software, you’ll get this pop-up every time you turn on your Mac computer. Download Java for OS X 2017-001 aka Apple’s version of Legacy Java Command-line tool. Mount the .dmg disk image file and install Java 6 runtime for OS X. Restart your Mac and enjoy the absence of this Java command-line tool error pop-up!